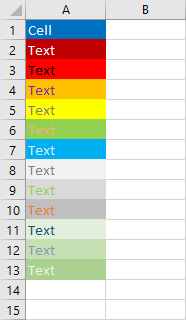 Each color in Excel has its index. You can get both background and font color with a shortcode. Let’s use the following example to illustrate how the code works. In order to check the cell background color, you have to use VBA. Press Alt + F11 to open VBA Editor. Insert a new module to the project. We will use this function to determine the background color. 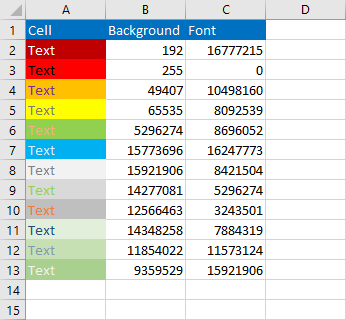 CheckBackgroundColor = "Enter one cell"
The following function checks whether the range parameter is only a single cell. If it’s not it, it will display a text informing you to enter a single cell as a parameter. If you entered a single cell, the function displays its background color. You can quickly modify this function to works also with font color. CheckFontColor = "Enter one cell"
What you get is a color in decimal form. You may want to convert them into hexadecimal form. If you use it for the white text you will get FFFFFF.